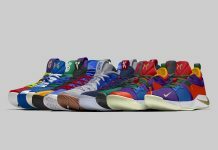 Each shoe has design elements that point both to a decade and to a piece of Kyrie Irving’s personality. The Nike Kyrie 4 ’70s channel Irving’s deft, dance-like handles through the psychedelic print on the quarter panel. The neon fluorescent patterns of the Nike Kyrie 4 ’80s honor Irving’s loud star-power with the ball. The bootie of the Nike Kyrie 4 ’90s is inspired by mornings spent watching classic Saturday cartoon shows, making good on Irving’s belief that you’ll always be a kid at heart. Look for the Nike Kyrie 4 “Decades Pack” to release on August 24th at select Nike Basketball retailers and Nike.com. The retail price tag is set at $120 USD each.